The brilliant and unfortunately late Terrence McKenna, in his book, Archaic Revival, posits that psychedelic experiences may include "cultural noise" from whatever culture they are produced and experienced. This struck me and stayed with me for some reason; when I read it I happened to be (and still somewhat am) going through a stage of hyperawareness about my own environmentally-accumulated psychic clutter. Looking at McKenna's idea in a very literal yet collective-unconscious-light, and if our contemporary American styled cultural noise could be one single entity finally, a "thing"--what exactly are the individual creatures that employ themselves in this loud job? Guaranteed to be trying to look busy within the noise are Brangelina, (can't stand that) Kinoki detox foot pads, anti-lock brakes, text messages, sock-monkeys, attention deficit disorder, Wal-Mart, lattes, etc. But the real workers in the noise are perhaps pretty small things, but definitely categories that can be named and recognized as a general form, minor little formulas, myths: infomercials, celebrity royalty, you get the idea--lots of stuff, and maybe something I noticed last night—the car chase. I watched Vantage Point, which I was looking forward to because I knew it had an unusual narrative structure. Never mind. It was messy, with bizarre, inexplicable performances by good actors like Forrest Whitaker and Sigourney Weaver. And when the inevitable obnoxious car chase was over, I was so appalled I said out loud, 'I could have done without the ridiculous car chase.' But, as I said it, it hit me for the first time that car chases are so utterly formulaic, ubiquitous and set that meaning must be attached. They are so popular because they are fast moving scenes with a great deal of excitement, but are not hugely expensive. Due to cars crashing and banging they can contain violence without any harm to individuals and thus secure higher ratings. So, it's clear people just like car chases. As the Wikipedia article suggests above, perhaps they are a 'safe' non-committal way to enjoy violence, for better or worse. But where does it all originate? Symbolically (and even etymologically,) it's not a stretch to assume that a car is a modern chariot. Chariots are meaningful, important objects and symbols of most ancient cultures and mythologies. 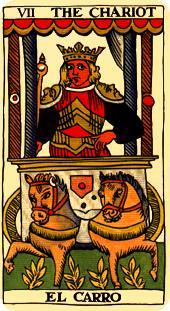 Within the Tarot schema, the Chariot card is numbered seven of the major arcana; a very loaded and magical number. The Chariot's symbology here has to do (generally) with will, freedom and initiative, spiritual journey, right path, and the quest through the universe for illumination. So this all certainly aligns itself nicely with the modern car chase in action movies—the idea of the everyman Hero overcoming impossible road rules and obstacles to his ultimate freedom and success; all components of the archetypal Hero Journey; a quaint insight, no surprises. But what of the cultural noise aspect of it? That Wikipedia entry mentioned earlier claims the car chase is fashioned largely out of a need for essentially a cheap thrill. Is that really the driving force behind something we can view as a meaningful little cultural myth? It's hard to discount this superficiality aspect as important in shaping the car chase myth—easy money, mindless appeals to the masses, violence for violence's sake (with no consequence)—and I suppose these are the features that are most easily noticed; the reason I was rolling my eyes at the scene in Vantage Point. Nevertheless, there does seem to be a world of meaning involved. 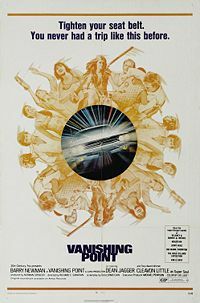 In browsing around on the internet about the history of the car chase, I came across several mentions of a film I saw decades ago, that I keep meaning to watch again—the cult film Vanishing Point. A classic and template of the car chase genre, one of the very first actually, it's important to note one of the characters is a stock character, a cinematic archetype—the Magical Black Man (think: The Shining, The Green Mile, The Matrix, etc.) Serving in his usual role as guide to a white male, Vanishing Point's blind, black DJ, "Super Soul" communicates psychically with the protagonist, Kowalski, the car chase instigator. On a final note, looking at all these spiritual, mythological considerations, it's interesting that a car chase is one of the "where were you when?" cultural reference points somewhat important to Gen-Xers and younger Boomers (I have seen this referred to as the "Seinfeld generation" ... kind of hokey, but it fits.) For this first generation to grow up with the cinematic car chase myth, it's not surprising that OJ's infamous Bronco chase, topsy-turvy with its own mythic violations left and right— received the attention and cultural bookmark it has. The Bronco chase is a Trickster version of the car chase, perfect for an inherited-social-guilt-ridden generation—complex with arguably positive and negative social motivations, dynamics, outcomes—a Hero journey on its head.